I just finished my second session with Jared Tendler. If you don't know who Jared is, he is a very well respected mental game coach, and in our sessions so far he has been focusing on my motivational issues, as we highlighted this as one of the biggest obstacles that I face currently. As I mentioned last time I simply find it harder than I would like to sit down and play a session of poker. We started off by filling in the gaps since of things that have affected me since our last session, including all the Black Friday uncertainty, tinker with my playing schedule and the adjusting of my goals. Although I'm no longer going all out to get Supernova Elite, it wouldn't hurt to keep it within the realm of possibility. Something that came up as we talked was that although I am only 1/4 of the way there with 1/3 of the year gone, I also have a 250k VPP headstart compared to what I would have next year. Things could change in a few months time and it would be a shame to have let it slip completely if a chance to make a second run at it were to come up. An interesting point that Jared made was that sometimes you can fantasize about something, in this case becoming the most super-motivated person who naturally worked hard without trying, can actually be de-motivating. You realise there is no 'switch' to become this person, and that realistically it will take a lot of work and effort to get into that mindset. The thought of the difficult road to becoming this person saps your motivation. Sometimes what Jared says just clicks, and I think this is very true of me, in relation to motivation, and in other areas of my life. I likened it to the fantasy I have about being a famous rapper, but my knowledge that it would take so much hard work just to get yourself in the position that it might be a small possibility, is hugely demotivating. Maybe this is why I haven't recorded a song in 6 years. Jared asked me what one of the biggest problems I faced with regards to motivation and playing, and I mentioned how easy I find it to not play because an opportunity comes up to spend some time with my son (now 20 months old). Those times when I'm starting my afternoon session a bit late, and Clark wants to go "ow-ow-out" (as he says it) or whatever, it is just so easy to give in because I love spending time with him, and it seems like such a good excuse to not play. The problem is, this ends up eating too much time where I should be playing, and although spending time with Clark obviously isn't directly a bad thing, I do get to spend plenty of time with him anyway and I don't need Jared makes a good point that I'm not necessarily sending the best message, that for Daddy "work" = "maybe work" or "sometimes work". Not only does he need to learn that "no means no" and similarly when "busy means busy" (especially considering I work at home), but also I don't want him to adopt the same attitude towards work that I have. This part of our session really hit home with me, as I obviously want the best for my son. If setting a good example by working hard and being motivated means Clark avoid's the issues I've had in my life with not working hard and not being motivated (definitely true of the last 10 years), then this can only be a good thing. I can glean motivation from my parental desire to do the best for my son in the long-term. Whenever I'm in these sessions I get such an inclination to go out, be super motivated and keep to a good playing schedule. I'm hoping this sticks as much as possible, and it's part of the reason I'm writing this blog post, so I can reference back and remember how motivated I felt from this session. It's hard to explain, but Jared's advice is complex yet really straightforward at the same time, and it's like a lightbulb is constantly going off in your head as he gives his insights and advice. 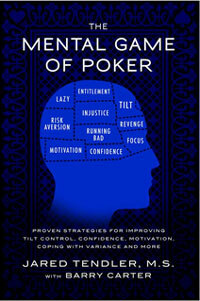 After the session I snap-bought Jared's new book "The Mental Game of Poker". I was always going to buy the book, it seems a steal at $50 when you consider how much Jared charges for his coaching (upwards of $250 an hour). If you enter the promo code "2011" you get 10% off and also the forum I post on, Blonde Poker, gets a small slice. 4 Comments to "2nd session with Jared Tendler..."
great to see, that you have blog. Very nice content. Never heard about SNG changes until I read about it here. Gl and see you at the tables! Really interesting to hear about! I'm going to order his book. I think it's smart to not totally rule out SNE. I have this gut feeling your going to do it ;). I hope you do, it is well worth it!